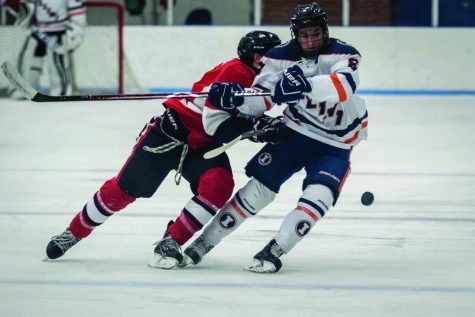 “It’s coming soon.” Players confident Varsity Hockey is in University’s future. 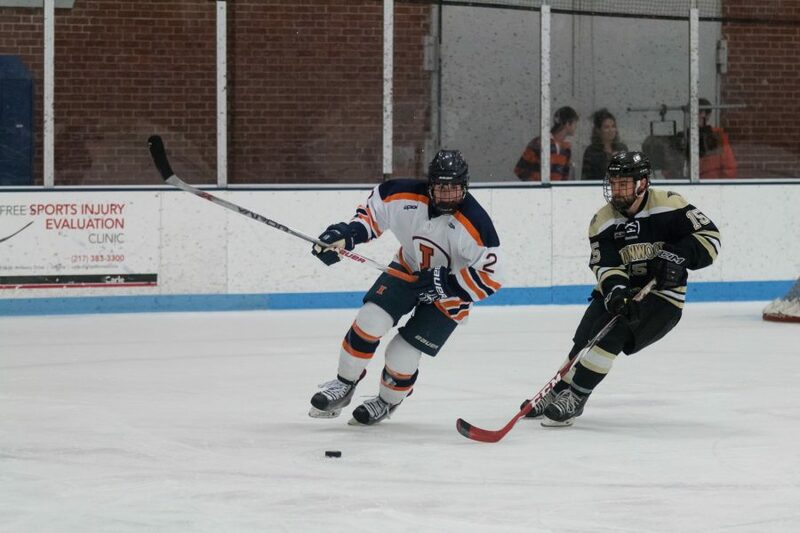 Illinois' Joey Ritondale fights for the puck during the game against Lindenwold University at the Ice Arena on Saturday, January 30. The Illini lost 4-1. Built in 1931, the Illinois Ice Arena sits at the corner of 5th and Armory on-campus at the University. 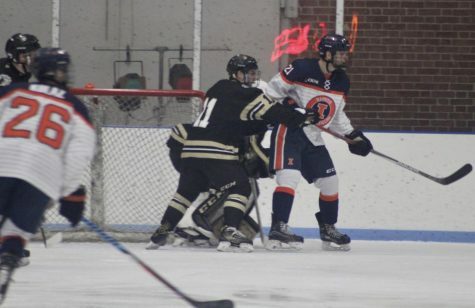 It hosts hockey games nearly every Friday and Saturday night from September through February for Illinois’ Division I club team. 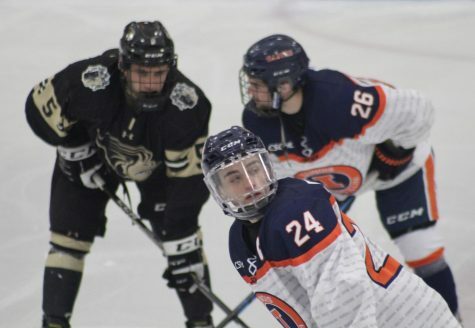 On a weekly basis, the country’s top teams, like Lindenwood, Robert Morris and Ohio, drive into Champaign on coach buses looking to take down head coach Nick Fabbrini’s squad. According to the team’s Twitter account, the Illini average nearly 1,500 fans per game. 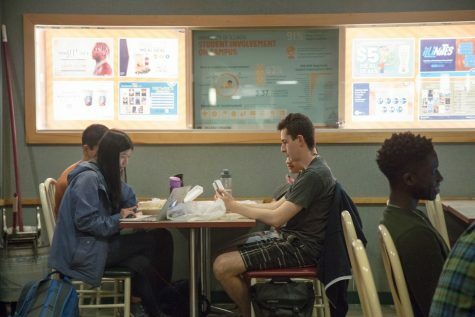 Nonetheless, except for the team’s rink rats, including the Harassing Illini student section, many members of the University’s community are often unaware Illinois even currently has a hockey team. 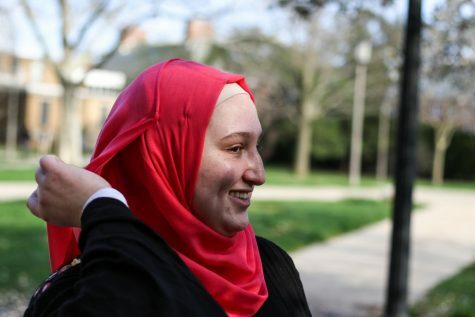 “I still laugh when I hear kids walking past me like, ‘we have a hockey team? I didn’t know that,’” Illinois hockey senior defenseman Joey Caprio said. 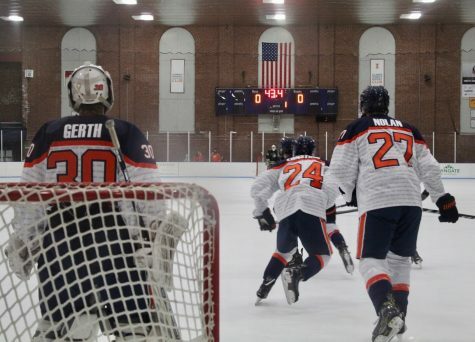 However, on Friday afternoon, Illini fans had reason to be excited about the idea of big-time hockey at Illinois. Prior to the start of the NHL Draft at the United Center in Chicago, Illinois Athletic Director Josh Whitman took the stage at a press conference with NHL commissioner Gary Bettman, Chicago Blackhawks president John McDonough, Buffalo Sabres owner Terry Pegula, the NHLPA’s Mathieu Schneider and USA Hockey executive director Pat Kelleher. 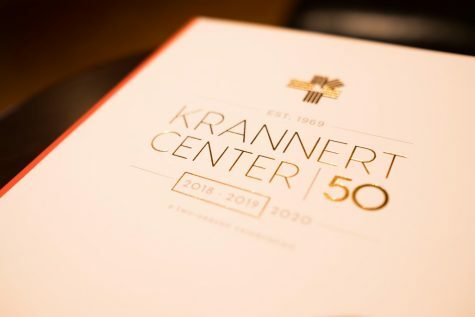 The group announced that the University would be the first of five colleges taking part in a feasibility study to determine if it could support a varsity hockey program in the future. 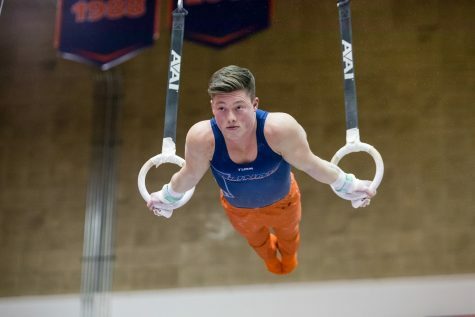 While nothing is yet finalized and the study is in its early stages, Caprio said the idea of having a NCAA-sponsored Division I team would be awesome. The press conference was announced last Thursday by SB Nation’s Travis Hughes through a tweet. Speculation on the details of the announcement ensued for the team and its fanbase. “It was pretty exciting to hear about it and read it and see who partnered with it,” senior defenseman Joey Ritondale said. 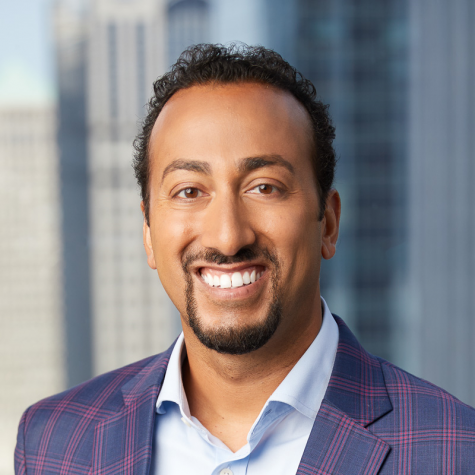 McDonough’s team, the Blackhawks, have won three Stanley Cup Finals’ since 2010, but his team’s state, Illinois, has not called a Division I hockey team home since the University sponsored hockey as a varsity sport from 1938-1943. Caprio, Cruickshank and Ritondale grew up in the Chicago suburbs with players in junior hockey like current Blackhawks Vinnie Hinostroza, a native of Bartlett, and Ryan Hartman of West Dundee. The trio of Illini agrees the suburbs’ top players would stay home and play for Illinois if the option existed. 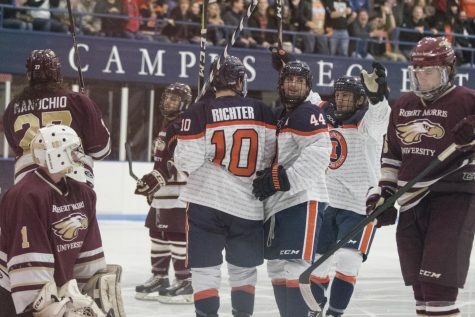 Two of the newest Division I hockey programs, Arizona State and Penn State, have experienced success in their first years after transitioning from the American Collegiate Hockey Association (ACHA), the league Illinois currently competes in. Penn State claimed its first Big Ten championship in 2017. The Big Ten currently has seven varsity hockey programs. The feasibility study will factor in Title IX considerations, annual expenses and community support. 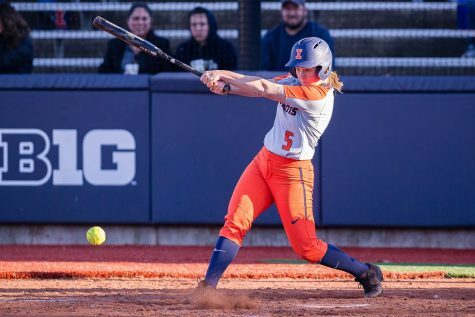 Regarding community support, the team hopes the excitement of the study’s announcement expressed by Illini fans across social media platforms results in higher turnouts at games this season. For annual expenses, the club team’s players currently pay a few thousand dollars per season for travel to games, ice time and gear and equipment. A University-sponsored varsity team would be based on scholarships and provide perks to its student-athletes. 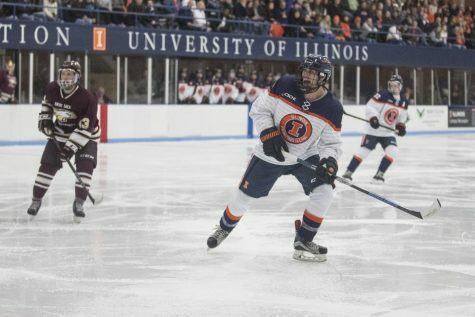 By the time the study concludes and an arena is built for Illinois’ varsity hockey program, as long as the study confirms the University can support a team, all of the Illini club players will likely have graduated. 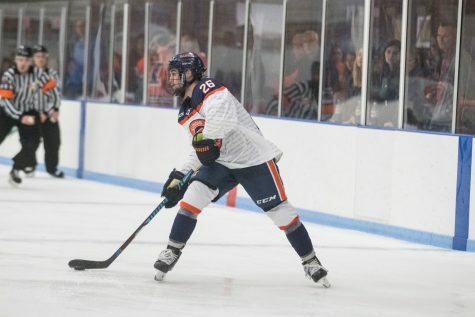 Ritondale, the team’s captain last season, said he still would feel as if he played a role in bringing big-time hockey to Champaign. 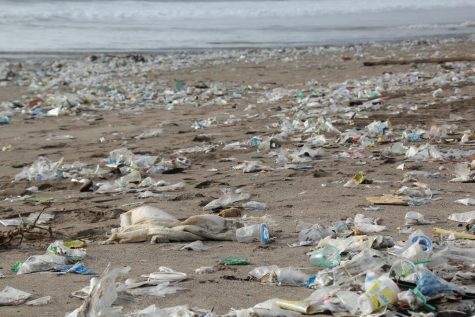 One expectation of the study is that doubters will exist. 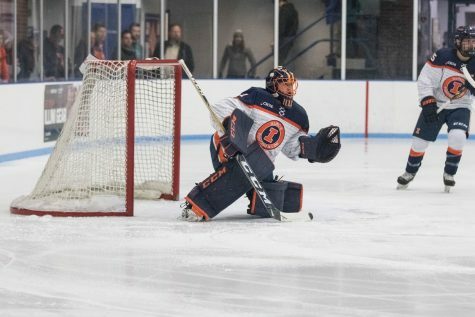 Some will argue that a college-town in east central Illinois cannot support a Division I hockey team, despite its club team two two national championships — both while Fabbrini was a player in the mid-2000’s. But everyone involved with Illini hockey believes Champaign-Urbana can, and eventually will, call a NCAA Division I hockey team home.